How much did I love this book? The 2018 Newbery Medal will be awarded in about two weeks. I'd be shocked if this isn't at least a contender. It's got everything--solid writing, a tear-jerker ending, cliffhangers, action and danger, little-known historical events, strong but fallible characters, international mindedness--what more could the Newbery committee ask for? SUMMARY: Three young teens and their families try to escape war in their home countries. Josef is a Jewish boy running from Nazi Germany in 1939. Isabel tries to escape Cuba in a makeshift boat in 1994. Mahmoud flees war-torn Syria in 2015 after his apartment is bombed. REVIEW: Everyone needs to read this book. Three young people, all around age thirteen but from different time periods and countries, flee from their war-torn homelands with their families. 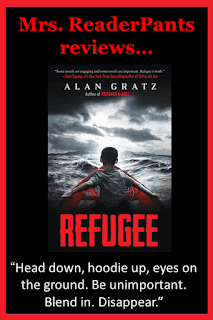 All three stories are compelling, and I love how author Alan Gratz weaves them together. Each chapter is a different point of view, and each is only a few pages long. Many of the chapters end on a cliff-hanger, some incredibly perilous situation the narrator has found himself or herself in. Because so many chapters ended this way, I read most of this book in one sitting. Refugee is a "just one more chapter!" kind of book that you simply cannot put down. Once you get past about 30 pages, be prepared to read it all at once. I cried at the end. I don't often cry in books or movies, so that's saying something. I knew the stories would end up entangling in some way. They did, but no spoilers here. Last, I have been looking for good books about recent Syrian refugees for the past couple of years. I work in an international school, and my students hail from all parts of the globe. The plight of refugees is something many of my students have heard about (especially those from Europe and the Middle East), but few of them understand what's going on or why the refugees risk their lives and everything they own to seek asylum in other countries. Refugee is a great first step in helping today's young people (and arguably, even people my age) empathize with political refugees. THE BOTTOM LINE: A solid choice for any library. Historical fiction doesn't fly off my library shelves, but I think many students will enjoy this action-packed story of people who are running for their very lives. STATUS IN MY LIBRARY: We have one copy that arrived about three months ago. Even before I read it or talked about it, it did get a few checkouts. Now that I have read it, I will booktalk it often. Violence: medium-high; war violence is major theme. Many people die, some in a gruesome manner. Love Alan Gratz! He will be visiting our school in a few months and we can't wait. I agree....I also have picked Refugee out as a contender. It is always on hold at my school. Every so often you come across a book that after you read it, you just sit for a long time thinking about what you just read. This is one of those books. I just sat in the peace and quiet of my house for about 30 minutes and just thought about what I just read. This book is so timely for our students and does a fantastic job on telling about the modern day immigrant experience.